I found this study to be absolutely fascinating. The link is to the abstract — the complete article is behind a paywall but I can get it for anybody who’s interested in reading the whole study in detail. 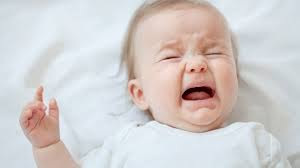 Its title is “Fundamental frequency variation in crying of Mandarin and German neonates.” I have always assumed, like most people I suspect, that babies cry the same the world over. When they’re uncomfortable or hungry they let us know by crying. It turns out this may not be the case. If so, then language development is pushed to the very first days of life — even before that, perhaps. It’s even more interesting when you consider that these are newborns. They’ve only been out of the womb a couple of days. So the implication is that they heard their mothers speaking while still in utero and acquired patterns of vocalization that they begin to use immediately after they were born. That’s quite amazing, I think. It has implications even for those mothers who don’t speak tonal languages: that is, your baby can hear what you’re saying, sense your tone. So maybe if you are angry and yell a lot your infant may actually be impacted by that. Something to think about.